Things aren't looking too good for our hero, ladies and gents! Darth Vader's got the young Luke Skywalker in the sights of his TIE Fighter, and he's blasting away. This Star Wars I Have You Now! 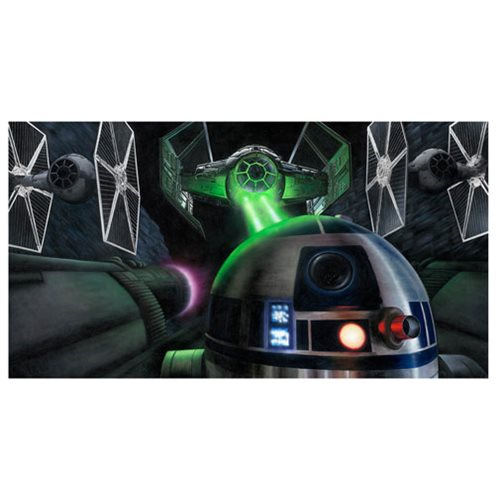 By Rob Surette Canvas Giclee Print is a stunning piece of art that recreates the scene on the Death Star in the original Star Wars: Episode IV - A New Hope film where Luke attempts to blow up the fully functioning space station using his X-Wing Starfighter. A limited edition of 95 hand-numbered pieces on canvas signed by the artist, this beautiful artwork print comes complete with a certificate of authenticity and measures 26-inches wide x 14-inches tall.